One of the joys of working with historical newspapers is finding things you weren’t looking for. Today, I came across a short article very appropriate for International Women’s Day, when we commemorate women’s struggles for political and other rights. Eighty years ago, in February 1935, the El Paso Herald Post announced that women would be selling enchiladas to raise funds. Their cause was LULAC, the League of United Latin American Citizens, which had formed a few years before. This group was one of the first to advocate for Mexican Americans’ full inclusion in U.S. politics and society. They also denounced the violence and discrimination faced by people of Mexican descent in the Southwest. Women participated in the organization almost from its earliest days. In fact, the El Paso LULAC Women’s Council was one of the first ones founded, and it is the oldest women’s council that still exists today. This brief article reminds us that women’s political activism sometimes incorporates traditional women’s work, like food preparation. 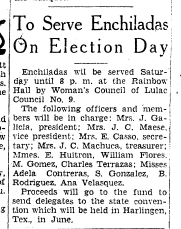 This group of señoras selling tasty enchiladas might not have immediately alarmed people in El Paso, but the women’s plan was to raise money to send their own delegate to a LULAC convention. Food was a means to a political end. In fact, in the last century, throughout Latin America women’s groups leveraged traditional aspects of femininity–from domestic tasks to images of motherhood–to make political demands and support causes. Here are two examples (in Spanish) from Argentina and Chile. These enchiladas suggest to me that this type of activism happened north of the border, too.